In our last Institute class we learned about the reality of Satan and the evil spirits in the world around us. That was Moses chapters four and five. In tonight's class we covered Moses chapter six in which we learned about the priesthood, the prophet Enoch and the Plan of Salvation. In this essay, I would like to focus on one single verse which teaches us so very much about God. If we all spoke the Adamic language, when we called upon God in prayer, there would be no confusion about who it is that we are addressing. Man of Holiness is his name. That phrase tells us succinctly that God is a man, albeit a perfect and holy man. He is a glorified and exalted man. He looks like us. We look like him. He was once a man like us. He passed through a mortal life. Joseph produced chapter six of Moses in November and December of 1830. This was after the Book of Mormon had been translated and published. This was after the organization of the church. Joseph was living in Fayette, New York. Sidney Rigdon and Edward Partridge had just been converted. Sections 35 and 36 of the Doctrine and Covenants were received for them. "God himself was once as we are now, and is an exalted man, and sits enthroned in yonder heavens! That is the great secret. If the veil were rent today, and the great God who holds this world in its orbit, and who upholds all worlds and all things by his power, was to make himself visible,--I say, if you were to see him today, you would see him in the form of a man--like yourselves in all the person, image and very form as a man...He was once a man like us; yea, that God himself, the Father of us all, dwelt on an earth, the same as Jesus Christ Himself did." Brigham Young taught (JD19:64), "Our Father in heaven is a personage of tabernacle, just as much as I am who stand before you today, and he has all the parts and passions of a perfect man, and his body is composed of flesh and bones, but not of blood." This was also taught clearly by Joseph Smith in D&C 130:22 - "The Father has a body of flesh and bones as tangible as man's." Orson Hyde said (JD1:123), "Remember that God, our heavenly Father, was perhaps once a child, and mortal like we ourselves, and rose step by step in the scale of progress, in the school of advancement; has moved forward and overcome, until He has arrived at the point where He now is." God our Father in heaven, passed through a mortal experience just as we are doing. Was God once a sinner? Theologian W. John Walsh explained, "The critics argue that since we believe sinful men can become gods, it is a natural conclusion to say that our God was once a sinful man. However, they conveniently twist our theology to meet their reasoning. Their reasoning presupposes that when faithful Latter-day Saints become 'gods, even the sons of God' (D&C 76:58), they become beings equal and independent of our Heavenly Father. However, this is incorrect. "While we believe that the faithful will enjoy a life similar to our Heavenly Father, we also believe we will still be subject to and worship the God of Heaven, which is represented as the Father, the Son, and the Holy Ghost. We will never be at the same level as them or stop worshipping them, but we will be like them and enjoy a quality of life similar to theirs." "In no place does the Prophet Joseph argue that our Father in Heaven ever sinned. He simply says that since Adam had a body fashioned after the image of God, then God's body must be like Adam's or his descendants (us). Likewise, he says that our Heavenly Father once 'dwelt on an earth, the same as Jesus Christ himself did.'" We do not teach that God was ever a sinner. 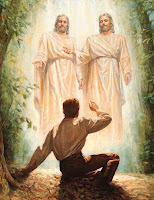 When Joseph Smith went into the grove to pray on that spring morning in 1820, he declared that he saw God the Father and His Son Jesus Christ. Critics and historians have argued that he did not make that distinction clear for many years. I have written previously about the multiple versions of the First Vision. I concluded that I found no discrepancy in their content. Did Joseph teach from the beginning that God was once a man and that he passed through a mortal existence the same as we are doing? I don't know how early he taught this truth, but it is evident from his translation of Moses chapter six in December of 1830 that he was familiar with the phrase, "Man of Holiness" and all that implied. Joseph knew then that God was once mortal. I learned these truths as a child and have taught them all my life. This knowledge of His true character enables me to exercise greater faith in God. Joseph told the truth about what he said he saw and I believe him when he taught that God was once a man. I also believe than man can become like God and achieve exaltation, but that's a subject for an essay at some other time. I very much appreciate your clear thoughts. I think the best representative of God the Father that we have is Jesus, and Jesus was sinless. Consequently, I have NO reason to think God the Father ever sinned (as you state in your essay). To me, the so-called mortal experience of God the Father was more like that of Jesus in some way than ours. I do not presume to know any details. Despite the notions of God having a mortal experience, I have no reason to believe anything other than that God the Father is eternal, everlasting, and without beginning or end. In other words, mortality was just part of his godhood. Have I missed something? Correct me if you think I am wrong. Anyway, the beauty of the doctrine is to realize that God the Father and Jesus have experienced what we have experienced. They know what we are going through. They have experienced every pain and joy. We are their children, and we are of the same species. Clarification: my parenthetical remark above "as you state in your essay" would be more clear if it had said "as you CORRECTLY state in your essay." Some have shared their personal belief that God our Father did indeed pass through mortality in a similar method as did our Savior Jesus Christ. In other words, he walked in perfection on an earth as did Jesus, and performed an atonement as did Jesus. Sin was never a part of his life. He was always perfect. They base this on additional quotes from the King Follet discourse that I did not share and clues left in the record of the new testament in which Jesus said in John 10:15 "As the Father knoweth me, even so know I the Father: and I lay down my life for the sheep," implying that he is doing what his father did. See also John 5:20 - "For the Father loveth the Son, and sheweth him all things that himself doeth." Here is the additional quote from the King Follett discourse: "The scriptures inform us that Jesus said, as the Father hath power in himself, even so hath the Son power—to do what? Why, what the Father did. The answer is obvious—in a manner to lay down his body and take it up again. Jesus, what are you going to do? To lay down my life as my Father did, and take it up again. I confess that this bit of theology is a little beyond my present level of understanding. Perhaps those who have a firmer grasp of this concept could enlighten us. It is not something that is found in our orthodox teachings so I have never thought about it too much. I am content for now to know that God can understand me perfectly because he was once a man like me - mortal. Can I ask a question? How long does it take you to add in all of those hyperlinks?! That's incredible! I wish there was a plugin that would do this automatically. I blog as part of my gospel study. I may have a dozen browser windows open while I am researching the topic. I write the essay as I learn. Sometimes I include the link as I write that part of the essay. Other times I get too excited and forget. That's why I go back and add them at the end of my study session if needed. A typical study session and writing of the essay can take me two or three hours. I usually write late at night after work. The actual adding of the links takes just a few moments. If I had to guess, I would say it could add twenty minutes to my overall time to include the links, depending on how many I include in the post. I wonder if I am overdoing it. I hope my readers do not find them annoying. I know they are checked as I have been called on them more then once. I am very careful now to make sure they are pertinent to what I am writing in that part of the essay. The links help me later when I need to reference something. I know I found it once and can then quickly find it again. I too wish I could find some automated way to add the links. I will keep my eyes open. If I find one I will be sure to let me know. Thanks for visiting my blog. I was just reading on yours today. I would never had seen that video of the news report about what goes on inside the temple if I had not found it on your site. Thanks. Thanks, Tim, for insight into how you blog! My method is very similar. I usually learn as I go along. I also like the fact that I can search my own blog and refer to something that I have already written about or researched before. It's a kind of study journal. I was just amazed by the number of hyperlinks in your article. I agree that they are helpful, particularly for those who are unfamiliar with LDS terms. I have found a plugin for stand-alone WordPress installs that will automatically link LDS scripture references to the online scriptures. It is called LDS Linker. Unfortunately, I don't think it will help you since you are on Blogger. I wish I could find something similar that would auto-link to other LDS topics other than the scriptures, like the Bible Dictionary, etc, and perhaps Wikipedia and Mormon Wiki. That would be nice. And thanks for reading and linking to TempleStudy.com! I have to agree with S.Faux. The confusion is likely found in Genesis, where we are made in "our" image and after "our" likeness. This is better understood as Adam being in a human form like Jesus, and in a spiritual form like the Father and the Holy Spirit. This can be substantiated by the reference in Gen 5:1 wherein the decendents of Adam are noted as only being made in the image of Adam, who had now fallen. Presumably, Adam's fall took away the image of God part, and made the likeness remain, like Jesus likeness, who is eternal as we know from John 1. Therefore, Jesus had to be a man who was once again made "in our image, after our likeness" to be the second Adam, having a body like Jesus and a spirit like God. In this way, Adam's sin could be removed. To accomplish this, the "knot" had to be untied, therefore we needed a man to be born of a virgin, as was Adam in a sense, who then did not sin and removed the sin of the posterity of Adam by hanging "the fruit back on the tree (the cross)", if you will. Therefore, God is not an exalted man, for only Jesus could be regarded as the likeness given to mankind. The image, or spirit (spirit of God which was breathed into the man Adam and thereby transmitted to Eve, who was of his same body) was lost at the fall. One more thing of important note that I forgot: God cannot be an exalted man because to be so would render his sacrifice for the sins of men useless. Only an infinite God can atone for the sins of humanity. God had to be (1) perfect and sinless and (2) infinite. Here's why: One man who is perfect would not be able to pay for an eternal life in heaven. Think of it as the price of a ticket. If I am going from LA to SLC, and the fare is $100, isn't it reasonable to assume the fare to NY is higher? Well, what is the fare to infinity? Can any one man in any one lifetime earn enough to pay that fare? No. Hence, the fare had to be paid with an infinite price - the life of God. The good thing is that God has infinite numbers of infinite lives. He can be in infinite places at once, since He as a Triune God, can be anywhere and everywhere. So, by nailing Him to the cross in the person of His Son, He was able to "pay the fare" to eternal heaven for an infinite number of human lives. This is not possible with an exalted man. Thanks for reading and commenting on my essay on Moses 6:57 where the phrase "Man of Holiness" is used by Enoch, probably quoting from the Book or Remembrance kept by Adam. I am so grateful for modern revelation and that Joseph Smith was able to be the instrument in the Lord's hand to restore the first few chapters of the Book of Moses, which were lost. The source for our belief and teaching that God is an exalted man is Joseph Smith, not the Bible. We are not confused by misinterpretations of phrases in Genesis about man being made in "our" image. This is substantiated in Moses 2:26: "And I God, said unto mine Only Begotten, which was with me from the beginning: Let us make man in our image, after our likeness." It is God the Father who proclaimed to Jehovah, the premortal Jesus Christ, that man would be made in "our" image, referring to Himself and the Savior. God the Father is not Jesus Christ. They are two separate and distinct beings. God is an exalted man. We are made in his image. The source for this knowledge is the Prophet Joseph Smith as revealed in the First Vision. I suspect the source of confusion is in the terminology. When you say that God could not be an exalted man, it appears that you are referring to Jesus Christ. I agree with you that Christ was not an exalted man when He came to the earth as the baby Jesus. That was obvious. He was a God, and thus was able to offer Himself, an infinite being, as an infinite ransom for mankind. God cannot be in infinite places at once. His influence and his power, his light and his knowledge, yes, but his physical presence, no. That is the mission of the Holy Spirit – to communicate the mind and will of the Father and the Son to mortal men. God the Father was not in Heaven and nailed to the cross at the same time. They are two separate and distinct beings. Jesus did not pray to himself in the Garden of Gethsemane. He was praying to our Heavenly Father. Stephen saw two individuals when he was being stoned and bore witness of the Father and the Son. Joseph saw two individuals in the Sacred Grove and so testified. We are made in the image of God. He is an exalted being – a glorified and exalted man - a Man of Holiness.